This last week was a case of living a Chinese curse: May you live in interesting times. Nothing much out of the ordinary. Some things go wrong on the boat, then the wind dies for the rest of the week. And I am instructing people on the vagaries of being a day skipper on a sailing yacht. Not easy when there is no wind. Or hardly any. But the story goes beyond this bland excuse. Boats break from time to time. And the wind dies or goes into overdrive, so to speak. The Cape of Storms, no less. So we have much wind or hardly any. And mostly we pray for mild winds. This last week I prayed for clemency from the Gods that may be for allowing me just to complete the course in a sensible fashion. And it did happen. The wind went away and the boat chose to stop working at the most inopportune times. But sensibility prevailed and we managed to get all the exercises in, despite the setbacks. The vagaries of sailing, indeed. In retrospect, this last week taught me quite a few lessons in addition to those lessons the students had from me. It taught me patience. And it taught me not to behave in an uncouth manner when things go wrong, as is wont to happen. I think those are the right words. English is not my first language. 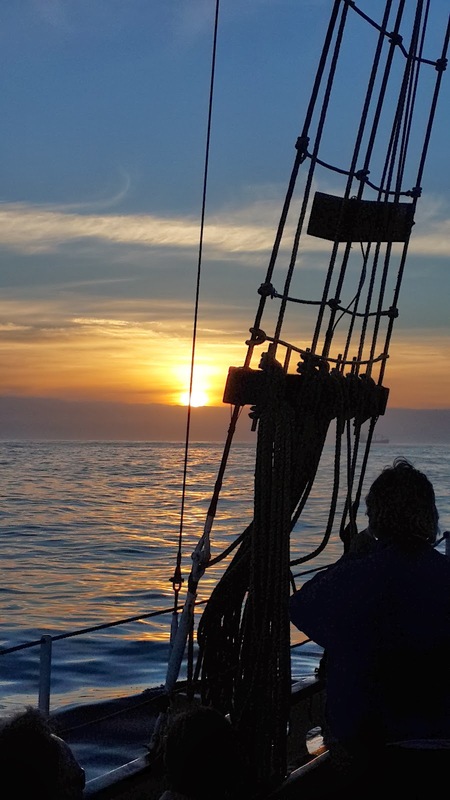 The syllabus calls for an introduction to certain aspects of sailing a boat, with special reference to safety aspects, some navigation and more important, the ability to think independently as a skipper. After all, you have life and limb in your hands as the skipper. Of other people, I'll have you know. Even though it does not come out as urgent as one would like it to be. These students, however, got a proper dose of experience. I made lots of plans this past week, quite taxing on the mind, given that I have to instruct at the same time. After all the trials and tribulations I can clearly say that this has been a revelation to me as much as to the students, about the vagaries of running a sailing boat. And the lesson was in keeping going, and not to yield to the temptation of giving in. In today's life I get the idea that lots of people just give up a dream, a job, a difficult task. Give in to the temptation of taking it easy. Not swimming against the tide once in a while. Of course, swimming against the tide all the time is frowned upon all over the world. Rather like being a full time professional rebel. Not a good idea. We had a burglary on board, the miscreants stealing my purse with all my ID documents, cash, driver's licence and all my skipper's tickets. This cost us half a day for me to conclude the admin at the police station. But the police were on the ball and had retrieved my cellphone before I even knew it was stolen. Chalk one up for serendipity and being wide awake! And the boat broke, as sail boats do from time to time. In this case, the starter motor/ Bendix assembly broke. Which meant that we could not start the engine. And we were out at sea. How do you get back into a harbour with no engine and with two bridges that have to open to get you into the marina? But the real lesson came to my students, when they had to sail the boat on their own while I was ducking into the bilges and engine compartment to help them sort out the stuff that went wrong. Even though they may not realise this even today, they had a mind shift to independent thinking. Taking charge for real. Brought on by the mishaps on board. A lesson that I cannot possibly organise on my own. And somehow I think the lesson also pertains to me as well. Experience is always a good thing. Especially when you feel it on your own backside, so to speak. You are never to old to learn, says the adage. And we had some romantic times, the students and I. Romantic as in the Romanesque way. Or as the Romans would have done it. 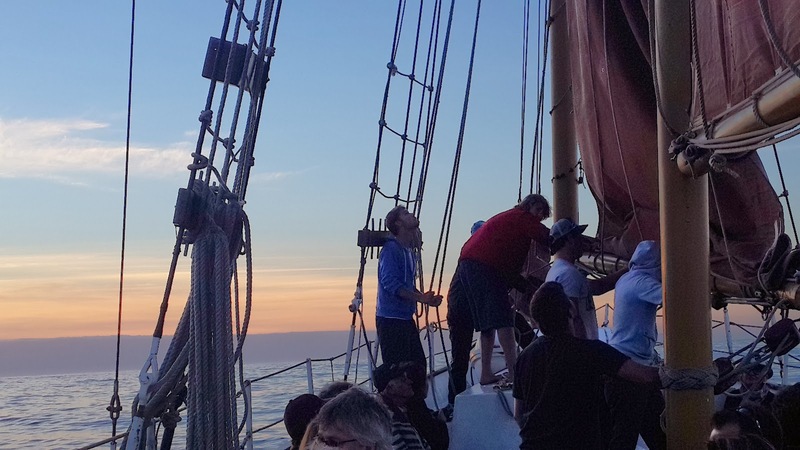 On a real schooner, sailing into the sunset, then helping with the stowing of the sails and general ship's husbandry. Something else, out of the ordinary. And in style. Grand style if you wish. And a positive mindset, hopefully for all, at the end of the week. May we live in interesting times forever! Images by Samsung S4. My camera was also stolen. The last year ended for me with much change in the offing. Several business opportunities came along, but none really gelled until early December. I had an opportunity to coach some sailing novices at my local sailing academy.So, it came to pass that I was on the water for the last week introducing these wonderful people to the fun filled sailing lifestyle. Of course the students were apprehensive, as none of them had been on a small sailing vessel before. It was my task to set their minds at ease and to literally show them the ropes. The boat is large enough to hurt you seriously if you do things in the wrong way, so safety is of the utmost importance. Then there are the ropes. Except there aren't any ropes on the boat. When a rope gets used on a boat it becomes a line. Which is the collective name for ropes. As soon as the line gets a job, it becomes either a halyard or a sheet. It took a while to get these relative landlubbers into talking the talk. However, we had lots of merry moments. The boat is also small enough to make for some interesting living conditions. It is not possible for six people to stand in a group in the saloon. You have to make a human jigsaw puzzle arrangement to get everybody inside. And the boat does a metamorphosis twice a day, perhaps more, morphing from living space to a sailing vessel where everything is packed away and secured against the heeling when sailing. Another one of life's lessons in there. 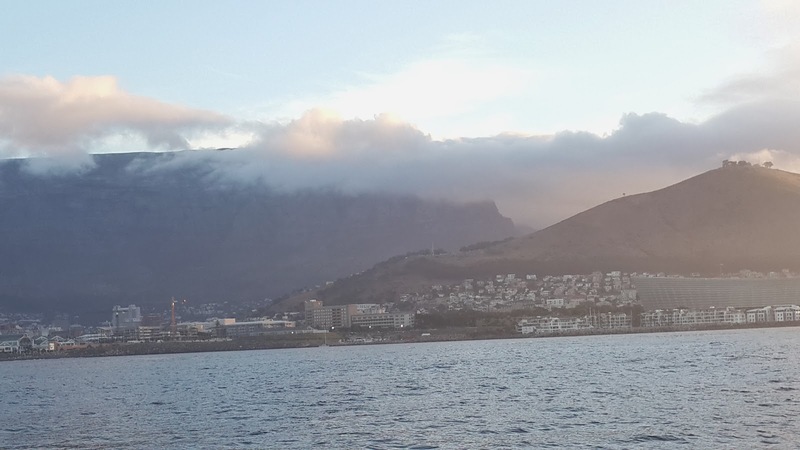 We sailed in relatively inclement weather from the picturesque harbour of Hout Bay on the Cape peninsula to Cape Town. I was hoping to get in some night sailing as well, as the syllabus requires this. And my hopes were more than fulfilled. 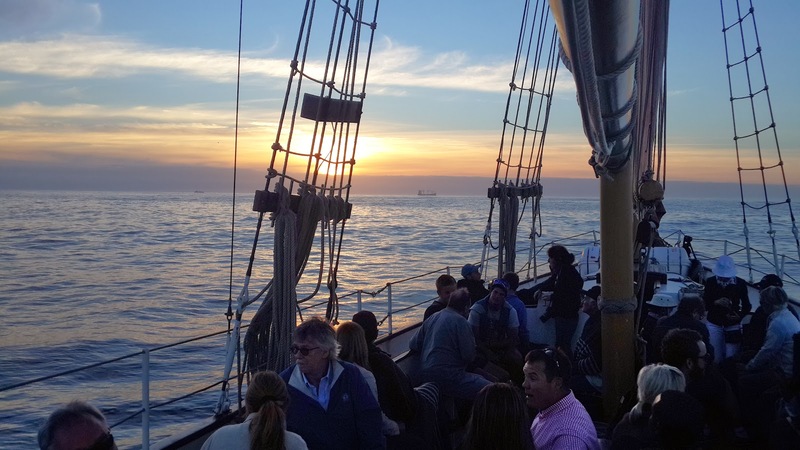 After tacking long miles out to sea and back to the coast, we arrived after 22h00 in Cape Town's New Basin at the Waterfront. Not having practised docking at all, I was a bit apprehensive about docking at night. But again Nature was kind to us and there was no wind and flat water, which made the docking a cinch. Being in the Cape Town waterfront means lots of places to visit. By this time, however, everyone was tired and hungry, so we had a meal and some beers before turning in. 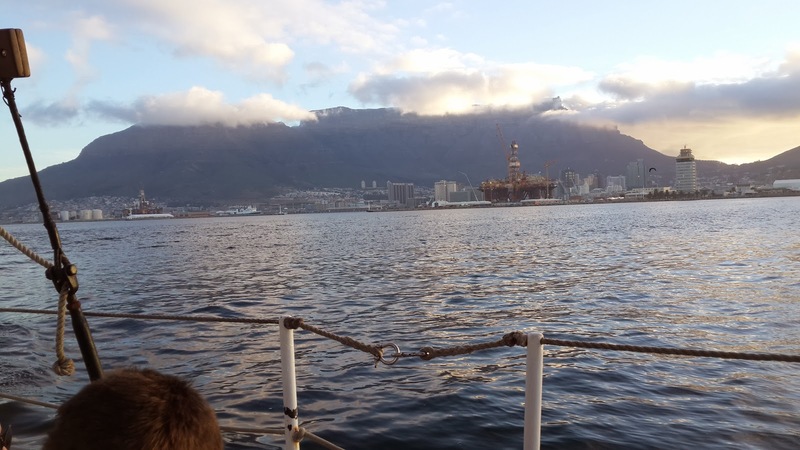 The next day we met up with fellow students on the academy's other boat and there was some chance of comparing notes before we set off back to Hout Bay. 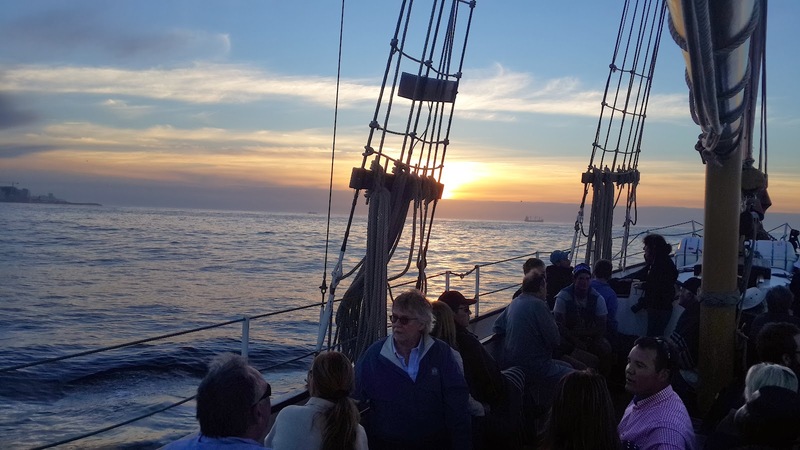 This time around we had a wonderful sail on a broad reach, with some twenty odd knots of wind on our port quarter as we rounded Hangberg at the entrance of Hout Bay. Exhilarating sailing, the students took turns to experience steering and surfing a boat of four and a half tons at around fourteen knots. 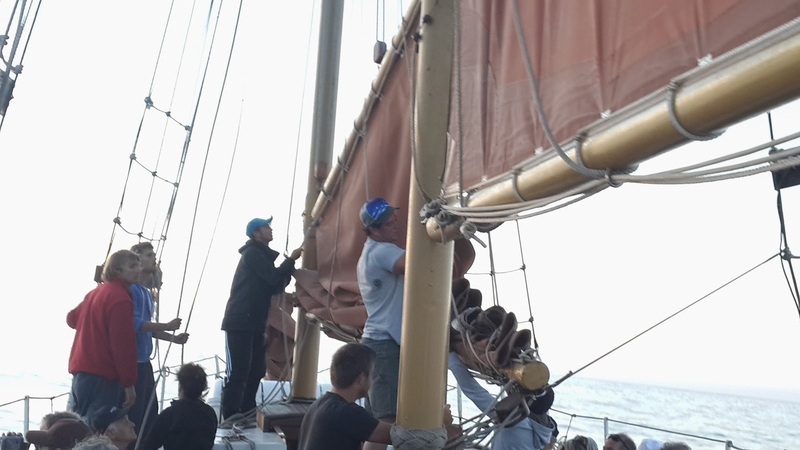 We had practiced a lot of the hard work part of hoisting, reefing and dropping the sail, so this was an apt way to close off our little cruise. The last day was spent in ship's husbandry. This means cleaning up, mopping the bilges, fixing small things and generally making the boat habitable for the next crew. After a week, I saw a relatively loose bunch of people turn into real sailors with enough experience to venture out on the water with no fear of the boat, safe in the knowledge gained through some hard work and then lots of fun on the water. In fact, I am happy to go on a cruise with these people. Did I succeed in introducing them to sailing? The smiling faces at the end of the course said it all. Did we have good food? How else, having the Hungry Sailor himself on board. Chili con carne, boerewors and mash, a pasta salad and a good sensual spaghetti Bolognese alla the Hungry Sailor. The students went away with at least three decent boating meals in their recipe books. Certainly they will not have a gripe about the food on board. Another small lesson in provisioning, I guess. A metamorphosis for the students. As for me, I stepped into the instructor mode with some trepidation, as this was my first class of students. So I studied all my old notes from my skipper courses as revision prior to the course. Then, when the time came to stand up, speak up and doing things, something changed in my head and soon I was into the mindset required. Shakespeare remarked that present fear are less than horrible imaginings and so it was with me. I also went through a lot of firsts during this week, both physically and mentally. And I am sure that there will be more of this to come. A metamorphosis for me too. For the better, I think. Life is a challenge meant to be lived to the full.